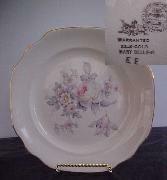 Royal China (USA).... Mary Belle.... Pink/White Floral...Gold Trim...Scalloped... Dinner Plate CHIPPED. 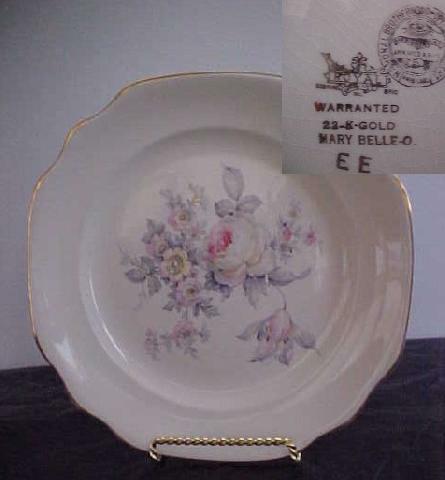 Marked on the back "Royal China..Sebring, Ohio...Warranted 22K Gold...Mary Belle". Featured is a Dinner Plate, measuring approximately 9 1/8" x 9 1/8". The Dinner Plate is white with pink, white and gray floral, trimmed in gold and is in a very unique shape. I believe this is a RARE piece as I couldn't find much information about the piece! There is some light crazing, which is to be expected due to the age, but nothing major! There is also some light wear to the gold trim .There is a chip on the edge (see photo), but cannot see while looking at the plate head-on. Great piece to add to your rare vintage china collection! In good, used condition. PRICE: $12.99 plus $1.50 special handling charge.